Time for Another Blog Hop! 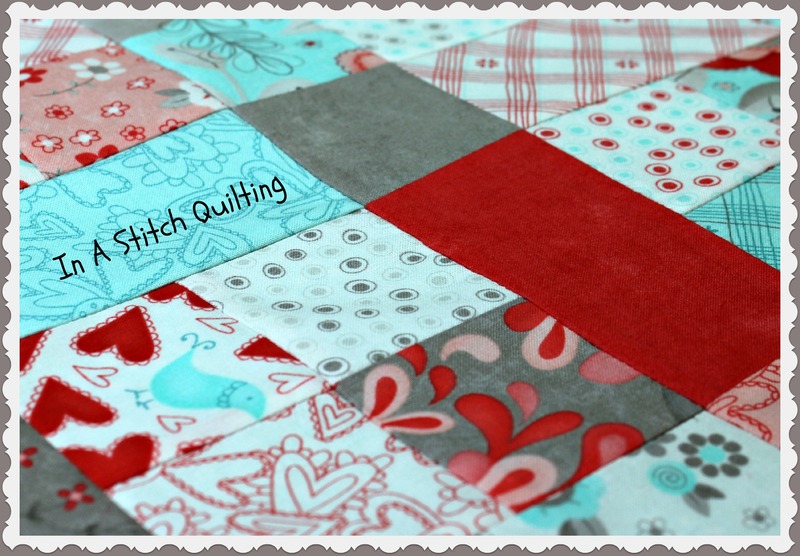 Welcome to In A Stitch Quilting! As my name suggests I offer quilting services. I use an Ansley 26 Tin Lizzie long arm quilt machine. I would be more than happy to quilt your next project. You may drop me a line by leaving a comment on this blog or by emailing me at cindy (at) inastitchquilting.com for further information. I entered the world of blogging in 2010 when my husband’s cancer returned. Through that blog I chronicled our journey from discovery, through radiation and beyond. While the blog is still up and running I typically only post when we have updates to share. This blog has been active since May 2012. I started this blog as a way of promoting my business and as a platform to share my love for quilting. As you browse through my blog you will find pictures and stories of my projects and quilts. Stay long enough and you may even meet my sweet little puppy, Sadie. 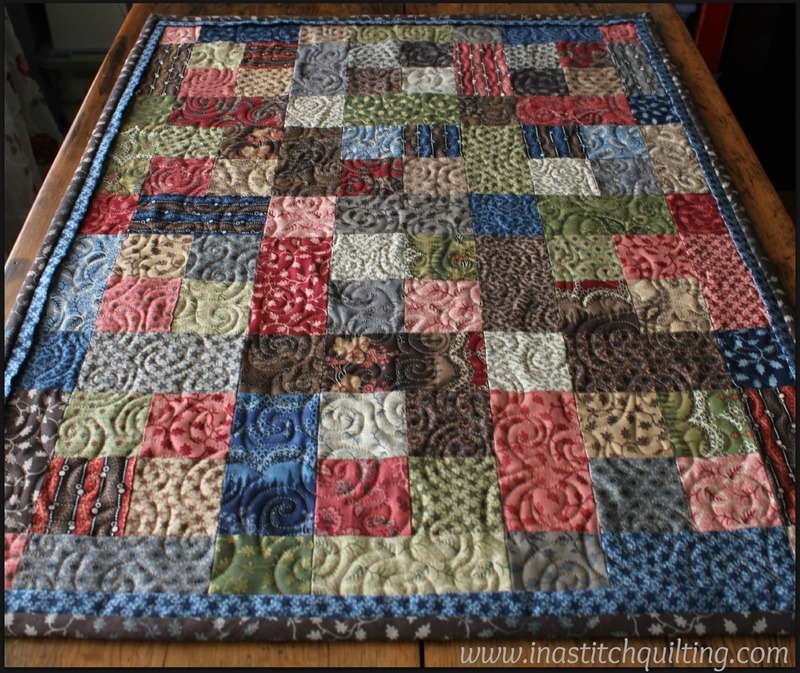 I am currently participating in Freshly Pieced’s WIP Wednesday and A Lovely Year of Finishes. Friday’s are set aside for “favorites.” Favorite notions, shops, fabrics, food, etc. What falls in and around those days varies. I have great ambitions to join a variety of other challenges and activities. Nothing more can be added to my schedule though until I finish my last quilt for the Hurricane Sandy Project. If you are curious about the first three quilts I have finished for that effort search my categories for postings. I am a member of three quilt guilds. There’s the Rock Valley Quilters Guild, the Rock River Modern Quilt Guild and the Madison Modern Quilt Guild. I hold the positions of treasurer and public relations at the Madison Modern Quilt Guild. Now that you’ve learned a little bit about me it’s time to get this ball rolling. Time to learn what’s going on. Here we go . . .
Michelle at Quilting Gallery has a serious case of spring-fever. To add a spark of excitement to these long days of winter she’s organized another blog hop. I could use a bit of excitement as well so I have decided to join in on the fun. Last time I participated in her blog hop I made two adorable Hold Anything Bags by Dancing Crane Designs. I purchased the pattern from Mill House Quilts in Waunakee. While the bags were a huge success I thought it might be boring to offer the same type of item. So this time around I’ve decided to do something different. Just like with December’s prize this one is hand-made as well. One very lucky winner will receive a hand-made table topper. The pattern I chose was the “Garden Party Runner” by Mary Cain of Cain Creations in Sun Prairie, WI. I’ve tried without success to locate an internet address for her pattern. If you are interested in obtaining a copy for yourself you might try contacting Mill House Quilts through their website. They have a wonderful supply of fabric, and patterns as well as notions. The pattern normally produces a 14″ wide x 38″ long adorable, super simple table runner. The first time I used the pattern I followed the instructions exactly as they were printed. Being a rebel who likes to do things her own way I decided this time to change things up a bit. To start, I’ve made this one a table topper with measurements of 20 1/2″ wide x 27″ long. Next I changed the dimensions of the piping accent. I thought the piping on my first project was too narrow. The pattern instructions don’t really tell you how wide to cut the piping strips so I guessed. Obviously I guessed wrong because they were barely visible under the binding. I was very unhappy with the appearance so I remove it. The piping on this new table topper is 1/2″ wide. The third change I made was the order in which the components were assembled. The pattern tells you to sew on the piping before you quilt. With the piping already attached it made it difficult to quilt. The only way to quilt underneath the piping was to pin it out-of-the-way. That seemed a bit odd. This time I added a row of stitching 1/4″ from the edge to stabilize the seams. Next I quilted the table topper. Once the quilting was complete I added the piping on all four sides. I was so much happier doing it that way. The outcome was much more pleasing. Are you curious what it looks like? Well I won’t make you wait any longer. Time to reveal this blog hop’s prize. As you can see I used the Metropolitan Fair charm pack for the body of the table topper. You can find a link to the fabric here: Barbara Brackman’s Metropolitan Fair . The piping was made out of Berry Blue Spirit of the Fair and the binding and backing are Charlotte Russe Chocolate Old Curiosity. Sandwiched between the fabric layers is a layer of Warm & Natural batting. THE GIVE-AWAY IS NOW CLOSED! Now I suppose you are wondering how to register. Well, here’s the deal. You have two opportunities to win. For your first chance all you have to do is leave a comment. To earn a second chance at winning start following my blog then post a second comment telling me that you did. If you are already a follower tell me so in a second comment. You may register for my table topper until Midnight (CST) on Thursday, March 14, 2013. One very lucky winner will be chosen by Random.Org and announced on Friday, March 15th. If for any reason the winner does not respond within the allotted time a second name will be chosen. So what are you waiting for? Get ready to participate in Quilting Gallery’s Beat the Winter Blues Blog Hop Party. Register to win my table topper then slide on over to Quilting Gallery and get connected to the other wonderful participating bloggers. Who knows? You just might be lucky! 158. That’s a beautiful table runner. Thanks for the chance at the giveaway! Thank you so much. You are very welcome! 157. Nice table runner. Love the quilting too. Thanks. Thank you so much. I’m so glad you stopped by. 154. I follow your blog by e-mail. 153. What a beautiful table runner! What a great giveaway! Thank you very much for your kind comment. Good luck with the drawing. 152. That is absolutely beautiful! Thanks for the chance to win it! Thank you so much for your sweet comment. Good luck with the drawing. 150. You have a new fan, me! I am so glad you found your way here. Thank you for the sweet comment. Good luck with the drawing. 148. You have made a really beautiful table runner and I think your quilting on it is excellent. I would love to win it; thank you for the opportunity. You are so very welcome. Thank you for the wonderful comments. Good luck! 147. happy new blog follower! 146. What an awesome giveaway!! Thanks much for the opportunity. Thank you very much! Good luck with the drawing. 145. I follow your blog via email and twitter. 144. I love your table runner! Great colours. Thank you so much for visiting! I think it’s wonderful that you like the table topper. Good luck with the drawing! 143. That is just lovely, thanks for the chance to win and nice to meet you! You are very welcome. Thanks for visiting and registering for the give-away. Good luck! 141. Thanks for the chance to win! 140. I will now follow you by email. 139. Very pretty runner, that would be beautiful on anyone’s table. Thanks for the chance to put it on mine. What a sweet thing to say! Thanks so much for visiting. Good luck on the drawing! 138. I’m a new follower by e-mail. Thanks for the giveaway opportunity! I’m so glad you are. You are more than welcome. 137. Your quilting is beautiful, and I love the table runner! Thank you so much! I’m very glad you stopped by. 136. And, please, I’ve been a follower for quite some time. May I have the 2nd chance, as well? That’s too beautiful to pass up! You certainly may! Thanks so much for registering. 135. As always, that is beautiful work. 🙂 Throw me down for an entry? Thanks so much Naia! Good luck with the drawing. I’m so glad you are. Welcome! 133. Shut the front door! That’s an amazing giveaway. Gorgeous! You certainly are lively! I think it’s absolutely wonderful you stopped by. Thank you for the sweet compliment. I will have to check out your blog. Good luck! 132. Hi I am a follower thanks for the extra chance. 131. Hi that is a beautiful topper. Thank you for a chance to win. Hi to you too. I’m so glad you found your way here. Good luck with the drawing. 129. I LOVE your table topper and would love to have it gracing my table. Thank you so much for your giveaway. I bet it would look nice on your table. Maybe you will be the lucky winner. One never knows. We will just have to see what Mr. Random decides. Good luck! 128. Gorgeous little project. I would love to win! So nice of you to say that. I would like to win it too but that’s not possible. Thanks you so much for stopping by. Welcome! I’m so glad you do. 126. Thanks for the chance to win! Thank you for your visit. I’m so glad you came. Good luck with the drawing! 124. Love the runner. It is gorgeous. Thanks for sharing and for the opportunity on a great draw. Thank you so much. I’m thrilled you like. Good luck with the drawing! I’m so glad you like it. Thanks for the sweet comments! 122. I am a new follower. 121. Very nice giveaway. Thank you for the opportunity to win. Thank you very much! You are very welcome. 120. Lovely giveaway …thanks for your generosity! I’m so glad you like it. I had a blast making it. Feels good to give something home-made away. Good Luck! 119. Just joined to follow. Welcome! I’m so glad you did. 118. I’m your newest follower! Thanks for the chance to win! Well that’s a good thing! Welcome. 117. Your adaptations and choice of fabrics certainly made a gorgeous runner! I’ll have my fingers crossed! Thank you so much for the sweet comments. Good luck with the drawing. Keep those fingers crossed. 115. and 116. I would love to win your beautiful table runner! I am already a follower. Thanks for stopping by and for following my blog. Good luck with the drawing! I’m so glad you like it. Thanks for stopping by. Good Luck! Thank you very much Gail! I’m so glad you stopped by. Greetings! Ich bin so froh, dass du gestoppt. Ich habe viele, viele Stunden damit verbracht, das Erlernen der Kunst des Quilten sowie Blogging und immer noch habe ich eine Menge zu lernen. Viel Glück mit Ihrem Quilt-und Blogging. Ich entschuldigen, wenn mein Deutsch ist nicht ganz richtig. Ich habe Google aufgefordert, es für mich zu übersetzen. Best wishes! 110. I’m a follower of your blog via email. 109. Your table topper is gorgeous! It would beat my “winter blues” for sure if I was to win, hehe. Love your fabric choices and your quilting is awesome! This would look so great in my house, hehe. It’s nice to be able to change or tweek a pattern to make it your own. Sounds like you have a place all picked out for the table topper. We will have to wait and see if Random.org thinks you are the lucky one. Best of luck. Thanks for stopping by. 108. Thank you for offering such a generous prize! You are very welcome. Good luck with the drawing! You are so very welcome! You have a happy day as well. Good luck with the drawing. 105. thank you for a lovely giveaway..
104. thank you for the giveaway–so pretty! Thank you for registering to win. I’m so glad you like the table topper. Good luck! Thank you for your kind comment. I’m so glad you like my table topper. 101. Wow. What a beautiful runner. Thank you so much. Thank you for visiting. I’m so glad you like the table topper. Thanks for the chance to win your beautiful table topper. Welcome! Thank you. I’m glad you like it. 97. Wow, amazing table runner and I love your quilting. I am a beginner longarmer so always appreciate seeing beautiful work. Thanks for the chance to win it! Thank you so much for your sweet words. Best of luck to you in your long arm quilting endeavor. I know you will have a lot of fun. Good luck! 96. It is beautiful! Thanks for the giveaway! 95. I’m a new follower. I’m looking forward to seeing more of your work. Welcome! I’m so glad you are. 94. Wow! The table runner is beautiful! The fabrics and the quilting make this a real treasure. Thanks so much for your generosity and for your inspiring blog! Thank you very much for your kind words. You are more than welcome! Good Luck! 93. I’m a new follower by email. Thanks for the giveaway. I’m looking forward to following your posts! 92. The table topper is lovely but really makes it stand out is your quilting. You are a very talented quilter. Thanks for the giveaway! Thank you for your sweet comments! I’m so glad you like it. Good luck with the drawing. 91. Love your creation. Thanks for the chance to win. Thank you for the compliment! Good luck with the drawing. 90. I really like the table runner. I especially like that particular fabric! Thank you so much! I’m so glad you like the fabric. Thank you! Good luck with the drawing. Thank you. I’m glad you like it. You are sew welcome! 87. A homemade gift is a gift that you will always treasure. I would be honored to win your table topper. Thank you for giving me the chance to win. They certainly are. Good luck! 86. I just signed up to become a follower. Welcome! I hope you like what you read. 85. I am also a follower already. 84. I have the perfect spot for your table runner. Thanks for the giveaway. I’m so glad you do. That way if you win it will have a new home ready and waiting for it. Good luck! 83. What a fabulous runner. I love the fabrics and the quilting. You did a great job. I’m so glad you like it. Good luck with the drawing. 82. I’m a new blog follower. Thanks for the chance to enter your giveaway. Welcome! Good luck with the drawing! 81. Your table runner is gorgeous, as is your quilting. I’m also participating in the hop so I hope you’ll stop by my blog and enter! Thank you so much! I will have to stop by your blog. It is my pleasure. I just love doing these things! Good Luck! 78. I do think the quilting makes the quilt, and yours is beautiful. Thank you for such a beautiful giveaway. Such a sweet comment! Thank you very much. I’m so glad you found my blog! Good luck. 77. Oh, how pretty! Thank you for the chance to give it a new home. 76. I follow through email. 75. beautiful table runner and the quilting is super pretty. 73. Lovely table runner, I hear it saying it would like to live at my house. Can you hear that, too. Thanks for the chance to win it. It is fabulous. Love the colors and quilting. Nce job! Oh I can definitely hear the whispering going on in the background. So much chatter! Well let’s hope Mr. Random thinks so too. We will have to wait and see. Good luck! 72. Love the quilting in this one. Well thank you! Thanks for visiting. Good luck! 71. I am a follower. Well I guess you will be visiting again since you are a follower. 70. That is one gorgeous table runner. The quilting is exquisite! Such a sweet comment. Thank you for visiting. I hope you come back! Good luck! 69. That table runner is absolutely beautiful! The golds, greens, and browns would match my dining room perfectly and the blues and pinks would add extra color to make it pop even more! Sounds like it was meant just for you. Good luck! 68. The table topper is lovely! Thanks for a chance to win. Thank you! I’m so glad you like it. Good luck! 67. Thanks for the chance to win. 66. Love, love, love the quilting! 65. What a gorgeous table runner! How sweet of you to say that! Thanks for stopping by. 64. Lovely table topper. Thanks! 63. Thank you for the chance, it is lovely and would love being in my home. You are so welcome. It is my pleasure. Good luck! 62. Your table runner is so beautiful and the quilting is just awesome! Thank you for the giveaway and for a chance to win it. I am so glad you like the table topper. Good Luck! 61. I love your table runner and would love to win it! Thank you! 60. The quilting on your liable runner is beautiful. I’m hoping I win. Thank you so much for the compliment. Good Luck! 59. Very pretty topper and what a nice give away. Thank you for visiting my blog and registering to win the table topper. I’m so glad you like it. 58. This table runner is just beautiful. Thank you for your kind words. I’m so glad you stopped by and took the time to register. Thanks for visiting and for registering for the give-away. 56. I am a follower!! I hope you enjoy my future posts. 52. I’m a new follower. Thanks again. 51. Love your table topper. Thanks for the chance to win. I’m so glad you like it. You are more than welcome. 49 and 50. I’m already a very happy follower too!! Well your table is very smart then. I think it has great taste! 47. The able runner looks lovely. I really like the way you have quilted it. Thank you for your kind words and for stopping by. Good luck! I’m so glad you did. Welcome! 45. Very pretty! Thanks for the chance to win! Thank you very much! You are so welcome.! 44. Your runner is gorgeous. Thanks for the chance to win. Thank you for the compliment. Good luck with the drawing. 43. I love you quilting! Thank you very much. I’m so glad you stopped by. 42. And yes…….I´m a follower of your blog! How wonderful to have a follower from Sweden! Welcome! 40. I signed up to follow you. 39. I would love to win such a beautiful tablerunner. Thanks for the chance. Thank you so much! Good luck. 38. I really like your tablerunner, particularly the swirly FMQ, it’s gorgeous! Thanks for the chance! 37. I’m a follower, I always read your emails first thing in the morning before I start working. Wow! I’m impressed. I hope you like them. 36. I love anything home made. I always cherish other people’s work as much as my own. Then I guess you came to the right place. Good luck. 35. Love table runners. One for every holiday/season! Cool. Then this is just the thing for you. Good luck! 34. Your quilting is stunning! Thanks for the chance to win he beautiful table runner! Well thank you very much! I’m so glad you stopped by. Maybe you will win mine and I will win yours. Wouldn’t that be cool! 33. I have signed up to receive your newsletters! Thanks again… did I tell you that I love table runners?! 32. Wow! Your quilt is beautiful and how generous of you to give it away! If I won, it will be cherished and will definitely Beat the Winter Blues! Thanks so much! Nothing like a blog hop to help beat the winter blues. Loads and loads of fun. Good luck with the drawing! 29. I am a new follower by email. I do enjoy meeting new blogs on the hop. It is such a fun way to find blocks that you otherwise might never come across. Welcome! 28. This is just lovely and would be wonderful to own. Thank you for sharing something homemade. Oh you are so welcome. Thanks for the compliment. I recognize your blog name. I sure am glad that you do. 26. What a lovely runner! I like to see how people choose their colors! 25. Wonderful giveaway 🙂 Thanks for participating in the hop! 24. I am a follower and receive your emails in my inbox. Thanks for participating in the blog hop. Welcome Alberta! I’m so glad you are following. 23. What gorgeous quilting you did on your Tin Lizzie. Very pretty fabrics and a beautiful prize for your lucky winner. Thanks for the chance to win a piece of your lovely work. Well if you win it I hope you think it is as lovely in person as it is in the picture. Good luck! 22. I just followed you on pinterest. I love the table runner, your quilting is wonderful. I also checked out your hold anything bags and they look fun to make as well. Cool! I’m so glad you are. Thanks for the compliment. The Hold Anything Bags were a joy to make. You would find them very easy. 19. I am a follower and receive your emails. Thanks for following my blog. I hope you enjoy the posts. 18. What a beautiful runner!!! I love the colors. 17. The topper is lovely. I really like the circular movement of the quilting. Thank you so much! You’re very sweet. 16. I am a new blog follower by RSS feed. Thanks again! 15. Beautiful table runner! Thanks for the chance to win! 13. this is beautiful table runner. love the quilting on it. Colors are great. Thanks so much for stopping by and for the thoughtful comments. 9. Beautiful! Thanks for the chance to win. Thank you so much! You are more than welcome! 8. I follow you by email. You are more than welcome! Thanks for the compliment. 5. your work is just beautiful! Thank you! You are so kind. Thanks for stopping by! 4. I’m already following you! 3. What a fabulous giveaway – count me in please! 1. What a lovely table runner! Thanks so much for the chance. I’m also participating in the party so hop onto my blog for a chance to win my giveaway!